Herbs: Herbs, the useful plants, have been grown in kitchen gardens since the earliest times, and were among the precious cargo brought with the colonists on their journey to America. Edible Flowers: Ancient herbals and still-room books- the cookbooks of their age, and are filled with recipes using flowers. Salads were gathered from garden and field; violets, nasturtiums, pot marigolds, and clove gillyflowers (dianthus) lent welcome color and often piquant flavor. Flower butters, syrups, conserves and confections were relished as well, and flowers were pickled and stored in crocks, to be eaten in the dark days of winter. A low maintenance long blooming ornamental with a distinct licorice scent to the bluish purple flowers and leaves. Bees adore it, and it makes a minty herbal tea and great dried flowers as well. Minty liquorice scented leaves make one of the best fresh-leaf teas available, much used as a delicious tummy soother! The tender young leaves can be chopped and added to salads that call for mint as well. This new variety has a compact, well-branched habit and saturated violet-blue flowers. An heirloom variety mix of pastel to bright colors and single to fringed double flowers on long stems just made for cutting. Easy care too, just deadhead for continuous bloom. Self-sows. Attracts beneficial insects such as ladybugs, hoverflies, and lacewings that helpfully deplete your veggie patch of pests. Judge’s scorecards were full of checkmarks for Calexis, a new compact, uniform and branching Calendula. Freely blooming, it is covered with large flowers composed of rolled petals, most blooms fully double. Great for pots and garden edging, and salads too, just tug some petals out of the center disk and sprinkle on top. 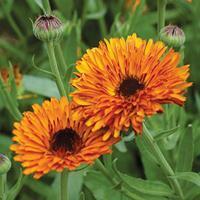 The indispensable “pot marigold” of old Pharmacopoeia has been transformed. Beautiful large flowers in new shades of cream to apricot pink are good cut flowers, host beneficial insects, and nurture pollinators. Deadhead regularly to keep the blooms coming. 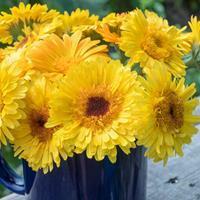 Crested flower centers have a halo of ray petals in a zesty lemon color. Dependable and easy. Edge your veggie garden with these and harvest the petals as they make tasty and colorful additions to breads, soups, and salads. Self sows. 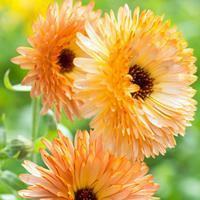 So easy to grow and so rewarding, every veggie and flower garden should have Calendulas. This new variety of an old favorite, sports a topknot of crested petals in juicy colors of lemon, apricot and mandarin. Sow direct in the garden early to mid-spring. Cut and fill little blue willow pitchers and bring the sunshine in, or sprinkle a confetti of petals on salads! 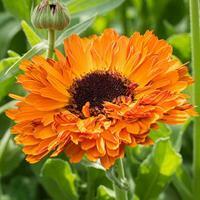 Glowing as if from within, 'Neon' has orange petals with a flashing reverse of burnt umber. No flower is more welcome wherever it appears from self-sowing; it keeps company with veggies in the kitchen garden quite well. Deadhead for neatness and be sure to pull the bright petals for sprinkling over salads! Peachy hues from streaks of orange and yellow will add cheer to any location that receives at least 4 hours of direct sun. Pull petals to sprinkle over salads for a bright and mildly spicy confettii or to garnish soups and entrées. Glowing as if a hint at the power within each radiant bloom, calendula has healed, soothed and held pestilence at bay for hundreds of years. 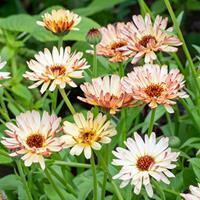 ‘Orange King’ is an old-fashioned variety from the early 1920s with bright orange petals. Snap off the faded flowers for continued bloom, or cut often, for it is useful and beautiful. Self-sows. 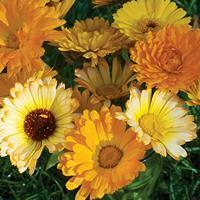 This is a lovely old-fashioned variety, the many-petaled flowers are warm apricot brushed with creamy yellow, and are held on tall stems, easy to view without the back-breaking crouching that so many modern dwarf varieties require. This soft color looks lovely with lavender and baby blue flowers. Pulled petals make a confetti of color and flavor for salads and quick breads. Listed in a 1957 seed catalog. Marmalade-orange quilled petals are arrayed around sunny yellow centers--a delicious confection, literally, for calendula petals have been used to color and flavor cakes and stews since Roman times. Easy to grow and long blooming. Self sows. 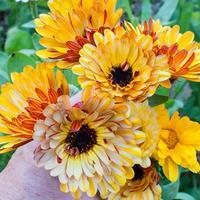 We love the two-toned petals of calendulas, this exclusive variety has layers of deep orange petals with a flaming red reverse and smoldering dark-eyed centers. A mix of yellow, pinky-peach and bi-colored blooms, all with a flash of deep red on the reverse. Pull individual petals for sprinkling on the top of salads or incorporate into quickbreads.Attracts beneficial insects ladybugs, hoverflies, and lacewings. Glowing sunset colors attract the eye from a distance; closer inspection reveals each warm orange petal is brushed with umber. The stems are long and strong so a few plants will furnish a vase of flowers every day. Self sows. Introduced to America by the Colonists, catnip has a long history in herbal apothocaries. Among a myriad of uses catnip tea is relaxing and soothing, especially effective in children. Most cats, on the other hand, are aroused by its signature potent minty scent that mimics cat pheromones, rubbing and rolling on the plant and eating it in apparent abandon. After 30 minutes or so they become temporaryily immune to its effects, a good thing as some cats can demolish the plants. Kittens, however, dislike catnip. Easy to grow, it can be pinched to cultivate a bushy form full of leaves, not flowers, preventing it from reseeding excessively. Attracts the beneficial insect soldier beetles. A strong tetraploid from Poland, with large flowers and a high beneficial oil content to relax and comfort mind and body. Chamomile attracts the beneficial insect tachinid flies. Ruffled, dark maroon, thistle-shaped flowers contrast with the silvery cast of the leaves and branching stems of this heirloom cornflower. A favorite cut flower, it was listed in Buist's 1942 catalog, but disappeared until the later 1940s. We are happy to offer it once again. Combine with silver foliage plants for a decidedly modern look. Self sows. Ruffled, dark maroon, thistle-shaped flowers contrast with the silvery cast of the leaves and branching stems of this heirloom cornflower. A favorite cut flower, it was listed in Buist's 1942 catalog, but disappeared until the later 1940s. We are happy to offer it once again. Combine with silver foliage plants for a decidedly modern look. Self sows. This product is not compliant with the United-States-Canada Organic Equivalence Arrangement (USCOEA) and is not certified organic in Canada.